LOS ANGELES – February 21, 2019 – Professional equine photographer Diana De Rosa from Long Island, New York was presented with the 13th Annual Black and White Spider Awards Nominee title in the sport category at the prestigious Nomination & Winners PhotoShow streamed Saturday, November 10, 2018. The live online gala was attended by over 17,000 photography fans around the globe who logged on to watch the climax of the industry’s most important event for black and white photography. The 13th Annual Jury members included captains of the industry from Penguin Random House, London; Contrasto Galleria, Milan; Young & Rubicam, Lima; Harper’s Bazaar, UK; Victoria Film Festival, Canada; Aeroplastics Contemporary, Brussels; Silvan Faessler Fine Art, Zurich; Time Inc., London; Galerie Hubert Winter, Vienna; Conny Dietzschold Galleries, Cologne; and Fratelli Alinari Photography Museum in Florence who honored Spider Fellows with 692 coveted title awards and 952 nominees in 32 categories. De Rosa is a veteran equestrian journalist, who has traveled the world and has recorded equestrian history for over 35 years. A language major in college, De Rosa went on to run a riding school, then was editor of an equine magazine for 13 years, and eventually focused on her writing and photography. She has over 1000 published stories and photos to her credit. She is the past president of the American Horse Publications and is on the Executive Board of the Press Club of Long Island. A long-time member of The International Alliance of Equestrian Journalists, De Rosa has been one of the few journalists to be credentialed to cover the past eight Olympic Games (including being on assignment for USA Today for the 1992 Olympics). She has also covered or been on staff at every World Equestrian Games, numerous Pan American Games and World Cups. Besides being a writer & photographer, De Rosa also does PR. Some past and present clients include the Hampton Classic, National and Washington International Horse Shows, USA Equestrian Trust, Healthy Horse Boutique, Running Wild, DreamWorks, the American Hunter-Jumper Foundation, and 20th Century Fox. For ten years De Rosa co-hosted the annual Hampton Classic Horse Show for the local Hamptons’ TV Station WVVH. She also does some radio reporting and voiceovers. De Rosa enjoys bringing life to her many equestrian stories through her camera lens and keyboard. For eight years until his death on October 11, 2004, she worked with the famed Christopher Reeve. De Rosa is co-organizer of the EQUUS Film Festival, which takes place annually in New York City, with tour stops around the US, including the 2017 World Cup in Omaha, NE and the 2018 World Equestrian Games in Tryon, NC. She also spent part of the 2017 winter taking photos for the Equestrians Got Talent, Althea and at the International Polo Club in Wellington, FL, which is where she captured this polo power moment. De Rosa is a part time actress and a SAG-AFTRA union member. She has performed in parodies, music videos, was a side-kick on a cooking show, appeared on The Food Network, featured on Gotham and Oceans 8 and much more. De Rosa is single and calls home Huntington, LI, NY. LONG ISLAND, NY – June 7, 2018 – Professional equine photographer and EQUUS Film Festival Co-Organizer, Diana De Rosa, was presented with first place at the Press Club of Long Island annual awards in the category of Non-Local Photo. The photo was taken at a polo match during the 2017 International Polo Club season in Wellington, FL. Second and third place went to photographers from Newsday, the well-respected daily newspaper on Long Island. To win ahead of two Newsday photographers was a real honor. The PCLI annual awards dinner was attended by over 230 guests, where close to 300 awards were given out to first, second and third place winners. De Rosa, who has covered eight Olympic Games, joined co-host David North and Eileen Lehpamer, from News 12, to MC the evening honoring the many award winners while also catching pictures throughout the night. The event was held at The Woodbury Country Club in Syosset, Long Island. In 2005, my mom was diagnosed with cancer and like any devoted daughter who was devastated by the thought of losing her “rock,” I went in search of answers. I came up with Hippocrates, a hidden treasure of health and wellness located in West Palm Beach, FL. While for my mom, going to their three-week Life Transformation Program didn’t happen, I never forgot what I heard in the orientation session we attended. Since then, I have devoted a large portion of my life to learning about alternative methods of health. I’ve delved into healthy eating habits, essential oils, detoxification, pH balancing and so much more. Now 12 years later, I still make the same suggestion but when people started to ask very specific questions, it became clear that if I wanted to give them answers, I needed to test the waters. While three weeks would be my ideal, a busy lifestyle allowed me one week to see what Hippocrates is all about. Now as I look back on that experience it’s my goal to share what I call the “gift of health” to others, especially those involved with horses. Florida in the winter is an area that has a host of horses in every breed and discipline including dressage, show jumping, reining, racing, polo, and so much more. So, it only makes sense that Hippocrates is a place for the horse people who love and care for them. While I continue to learn about how Hippocrates helps heal people, I was not aware that in the past it also has helped horses. In fact, over the years the same philosophies that Hippocrates uses for people, it has also used to heal and improve performance in people and in horses. I chatted with Hippocrates owner Brian Clement about that horse connection which took place back when this place of health and wellness had its headquarters in Massachusetts. “When I was still in Boston guests who came through the program and got extraordinary results were horse owners and some were race horse owners,” Brian commented. One of those owners approached Brian and asked if he thought the health benefits that humans were seeing could extend to a horse. Knowing that horses are already Vegans (which is the foundation of Hippocrates), he felt pretty positive that the same premise could be transferred to horses. One of the healing techniques that Hippocrates uses is wheatgrass poultices on wounds and it was this concept that they passed on to horses. This is done by taking left over pulp from after the wheatgrass is juiced and using that as a poultice to heal whatever is under it. The horses loved the sprouts and clearly looked forward to their daily addition to their diet. They also used different salves with herbs to help dissolve growths. In addition, owners and trainers were encouraged to ensure the horses were kept warm when they were sleeping. The combination of all the above proved to solve a host of problems and get the horses back in action much quicker than the normal turnaround time had been for the various conditions. “I learned a lot from that. I learned that we are not different. For the first time I gained a different respect for their intelligence. I believe that one of the horses thanked us. He got better and you could see a difference, not only in his attitude, but in his hair and mane,” Brian added. Once the headquarters moved down to Florida that part of the business ended, but with so many horses around, Brian has a renewed interest in working with horses again. He feels the best way to do that is to work with the people who own, train, ride or care for them. Before extending the benefits to the horse, it’s important that those working around the horses understand what Hippocrates is all about and then extend that knowledge to the horse. It makes the most sense for the individual(s) to be the ones who first learn the practices of the program. Once they see and understand how the Hippocrates lifestyle and protocols can benefit them, their family and friends then they can decide what might also work for their horses. The result will be a better life for everyone. 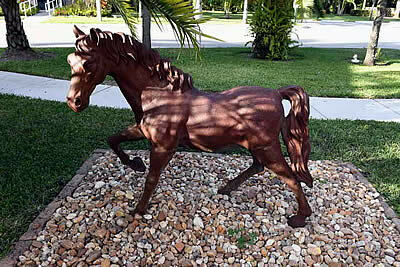 Both Brian and his wife Anna Maria have a love for horses and if you wander around the property you will see a variety of horse statues and artifacts. “Anna Maria and I both see the horse as elegant and complete. They don’t have self-esteem problems. These large bodies running 50 miles an hour; it’s a noble image,” said Brian. Brian feels that in a way he’s had a part in knowing that more people throughout the world are Vegan than ever before. Brian and Anna Maria live a life that never stops. Last year they spent 210 days somewhere in the world sharing their philosophy about the road to health. Health has no boundaries and as a long-time equine journalist who writes about and photographs horses, sharing my Hippocrates experience, especially with those who are horse enthusiasts, continues to be important to me. For more about the seven articles from my week at Hippocrates and to read future articles, go to http://hippocratesinst.org/a-hippocrates-guest-journey. On the last Wednesday of each month, Hippocrates has an Open House where you can learn more about what this institute offers. They also host half hour walking tours at noon on Thursdays and Saturdays with a program consultant. It’s a great way for you to capture the essence of this place up close and decide if any of Hippocrates programs would support your wellness goals. Keep in mind that even though your horse can’t go to Hippocrates, you can take advantage of the knowledge you gain, because many of the same protocols can also be of value to your horse. In fact, you can discuss your thoughts with one of the many Hippocrates professionals. They would be happy to guide you on how to best implement some of the things already mentioned in this article as well as other protocols, such as essential oils, massage techniques and more. These and other things could make life easier for both of you because Hippocrates is about health and healing for humans, so why not give that gift of wellness to your horse. For more information, go to www.hippocratesinst.org, or call 561-471-8876. And if you happen to know a person (or a horse) who needs some healing help, tell them about this health institute. LONG ISLAND, NY – March 12 – Professional photographer Diana De Rosa was presented with the 6th Annual Photography Masters Cup Nominee title in the category of Sport at a prestigious Nomination & Winners Photoshow. The live online ceremony webcast was attended by photography fans in 86 countries who logged on to see the climax of the industry’s most important event for color photography. To see the winning photo online, visit: Masters Cup Photo. INTERNATIONAL COLOR AWARDS, PHOTOGRAPHY MASTERS CUP is the leading international award honoring excellence in color photography. This celebrated event shines a spotlight on the best professional and amateur photographers worldwide and honors the finest images with the highest achievements in color photography. www.photomasterscup.com. Diana is one of HorsesintheSouth.com’s long time contributors for equine articles and events. This is a special highlight to her, so be sure to watch Worst Cooks in America on the Food Network this Sunday! Bio of Diana De Rosa (Huntington, NY): Diana’s late parents wished their daughter would learn how to cook, and she is ready for culinary boot camp. She grew up in a family where dinner was waiting on the table when she got home, but she is now on her own and needs to take care of herself. Diana, a photographer and health fanatic, currently survives on nuts, dried fruit, Greek yogurt, protein shakes and leftovers from friends. When she does attempt the kitchen basics, she burns food and can’t even work a blender without spilling the contents all over the kitchen. She’s been a successful equine journalist covering events around the globe, but cooking is the one thing she still needs to master. 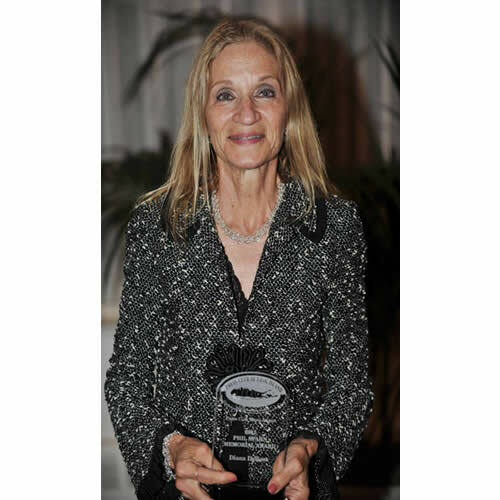 The Press Club of Long Island presented equine journalist Diana De Rosa with their prestigious Phil Spahn award at their annual awards dinner on Thursday, June 7th. The Phil Spahn award is presented to a PCLI member who has demonstrated outstanding service to journalism, PCLI or to the community. For the past three years De Rosa has been on the Board of the PCLI working diligently behind the scenes.